Are Route66® Coffees available in any grocery stores? 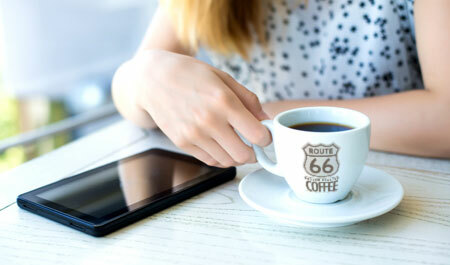 Route66 is custom roasted for USConnect and its nationwide network of affiliates. Our coffees are available in BistrotoGo! Markets, but are otherwise only available through our website. Changes in temperature wreak havoc on coffee. To best store your coffee, ensuring its freshness, keep it in an airtight container stored in a cool, dry (and preferably) dark place. That said, never put your coffee in the refrigerator or freezer. Coffee is porous and can absorb the smells and flavors that are stored in freezers (like seafood) and even the moisture that exists in a freezer, deteriorating the flavor. Can I get Route66 Coffee in whole bean? We currently offer bulk quantities of each of our blends in whole bean. These are not available online but may be purchased by contacting the USConnect office at (800)211-5970. We anticipate providing these online in the near future.